A writer wants to be read. The best most writers hope for is some currency among contemporary readership, and perhaps a semblance of a following while they still live. As for immortality, a writer takes solice in the fact that their work will survive them, but has no serious thought of being known and read generations after they die. That’s the domain of the rare and lofty masters; even the most outsized egos among us hesitate to aspire that high. 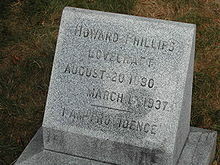 What then are we to make of Howard Phillips Lovecraft? Better still, what would H.P. make of his own immortality? It’s been 75 years since H.P. 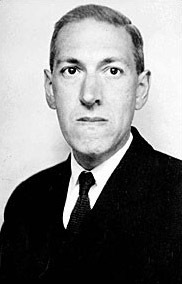 Lovecraft died, at the cruelly young age of 46. The author of a few dozen short stories and a handful of novellas, he saw little evidence in his lifetime of the impact his innovative horror, sci-fi and gothic fiction writing was to have. Although he was published, and published widely, and although his genius was recognized and commented on by more successful contemporary writers like Robert E. Howard and August Derleth, he was never able to truly enjoy the fruits of his work. He suffered chronically throughout his life from poverty and poor health; the latter, though, which included night terrors, probably contributed to the frighteningly real worlds he created. As real as those worlds were, and as influential as they are today, they probably simply came too early. Pulp-fiction editors of the ’20s and ’30s were intrigued, and printed nearly anything Lovecraft cared to submit. The readers weren’t as accepting. Most Lovecraft stories were met with letters of protest, and complaints that he was just too weird. They wanted the detective stories and the easily grasped sci-fi and fantasy they were used to. Lovecraft’s imagination asked too much of them. Somehow, against all odds, our culture has caught up with him. Lovecraft and his mythos are everywhere; Cthulhu, Dagon, Yog-Sothoth, and the misty gates Unknown Kadath have infilitrated our music, our movies, and in an ongoing way, our literature. Modern horror writers like Stephen King and Clive Barker not only cheerfully cite H.P. Lovecraft as their major influence, many of them continue to work within and expand upon the Lovecraftian mythos (in a way that H.P. would have surely approved of). There are far too many examples to cite, but Neal Gaiman’s “I Cthulhu” is one definitely not to be missed. This is all the sort of immortality that might not be expected, but is certainly not without precedent. Lovecraft himself might not have anticipated it, but some of his editors probably did. What no one could have foreseen, though, is how the Cthulhu mythos is making itself real. Broadly speaking, it’s called Chaos Magick; it’s a modern urban pagan movement seeking to harness both traditional and newer sorcerous paradigms, in an updated version of The Great Work. Pagans of all stripes are known to seize upon cultural traditions, using Egyptian, Greek, Native American and every other conceivable pantheon to create religions built of recognizable archetypes. But late at night, before the screaming began, voices probably whispered, and warned him that this was to be. 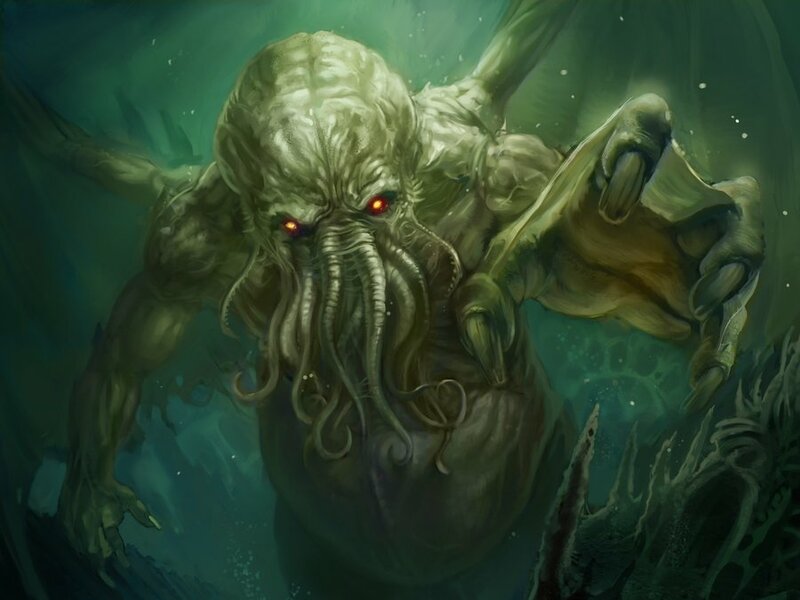 This entry was posted in New Post and tagged Call of Cthulhu, H.P. Lovecraft, Neal Gaiman. Bookmark the permalink. He would have chuckled and been flattered, but faintly appalled, by the commercial world-bestriding Lovecraftdom (or perhaps ‘Lovecraftdumb’ might be a better word in most cases) that his works spawned. He might even have enjoyed reading though the very best of the pastiches of his work. He would have written incisive denunciations of the neo-religious take-up of his work. What would have mattered to him would the prestigious uniform critical editions of his work, sitting alongside Poe and other American greats. And the library-filling amount of scholarly books, essays and conference papers on his life and work. Especially the attention paid to his philosophical ideas and his theories on the writing of weird literature. Fair points, mysterious stranger. I’d only add that if the neo-religionists (and Gaiman) are right about the power of cultural consciousness, then we can create a modern Lovecraft of our choosing. I suspect he’d wind up as the high priest of our dark, dark cult. GREAT REVIEW! I totally agree with all your thoughts you said in your post, especially at the end of your article. Thank you, your post is very useful as always. Keep up the good work! You’ve got +1 more reader of your web blog:) Isabella S.